Economic freedom translates to the increased welfare of a population, improvements in education and increased per capita income. James Roberts discussed these points at the University of Navarra; a researcher at the Heritage Foundation, he presented the 2015 Index of Economic Freedom at the Navarra Center for International Development. The Heritage Foundation, a renowned policy research think tank located in Washington, D.C., prepared the report in collaboration with The Wall Street Journal. According to Roberts, economic freedom involves "having a system with rules and a government that implements them impartially, that seeks justice and that is free of corruption." According to Roberts, this is reflected in aspects like a good banking system, reduced public spending and greater freedom of investment. 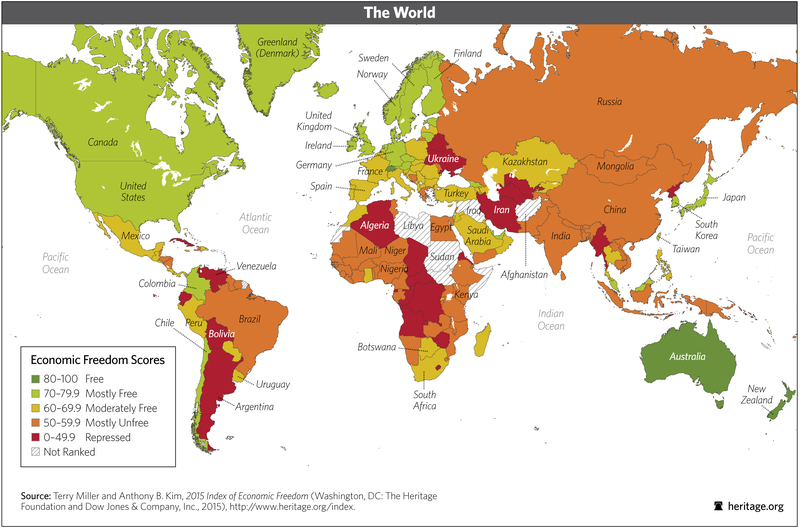 In this annual report, the Heritage Foundation measures economic freedom in 178 countries based on four pillars: the rule of law, the size of government, regulatory efficiency and open markets. In the 2015 ranking, Spain ranked 49 with a score of 67.6 (0.4 points more than in 2014). In Europe it is ranked 21 of 67 countries, making it, according to the parameters of the Foundation, a "moderately free" country from the economic point of view. "Spain's score will improve moderately over time. The reforms that the government is currently undertaking and that are beneficial for the country will be reflected," Roberts said. He referred to reforms such as labor, which "have been politically painful, but economically necessary." According to Roberts, in 2008, the economic freedom of countries worldwide plummeted to levels that are considered "mostly controlled," but since 2013, they have returned to levels seen before the crisis. According to the Heritage Foundation, greater economic freedom leads to less poverty in the world. "The level has dropped significantly in the last 50 years. In 2000, the percentage of the world population living in poverty was 34.1%, which has fallen to 20.1% according to the latest 2010 data," he said. "We believe that, in large part, this decline is due to increased economic freedom worldwide." According to James Roberts, one of the biggest problems in developing countries, especially in Africa, has to do with the corrupt political regimes that hold power "as if they were absolute monarchies." "This problem," he concluded, "is closely related to property rights, since they can only be guaranteed in a system of rule of law that is free of corruption." James Roberts visited the University of Navarra on an invitation from the Navarra Center for International Development (NCID), one of eight projects within the Institute for Culture and Society, the humanities and social sciences research center at the University of Navarra. NICD's aim is to research methods to effectively combat extreme poverty in the world and promote development. Publications: Government debt dynamics and the global financial crisis. Has anything changed in the EA12?